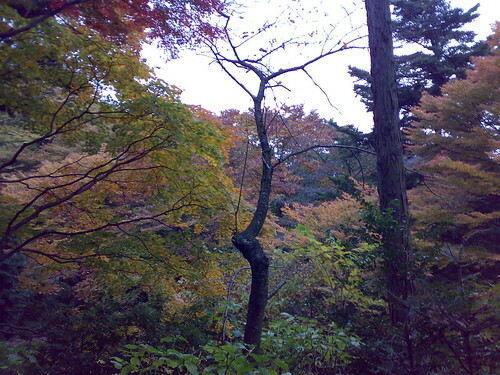 In mid-summer when its too hot to want to do anything, I start to yearn for autumn. Autumn is my favorite time of the year, the weather is not too cold or too hot, and the humidity that rears its ugly head in summer fades away day by day. The brisk air of October and November are priceless, and of course the colors of the leaves remind us not everything is green. So I turn back in my photo archives and found some pictures I had not yet shared from Taka0-san (Mt. 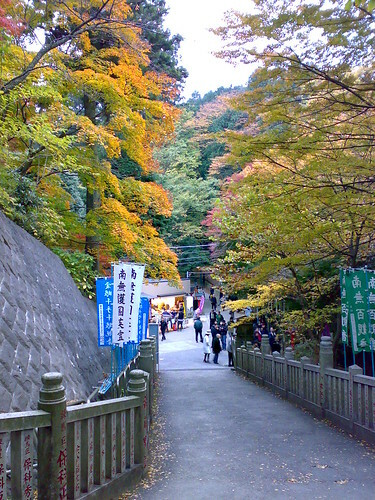 Takao), just outside of Hachioji. I’ve always been fascinated by the statues one finds at Buddhist temples, I just wish I knew more about them! 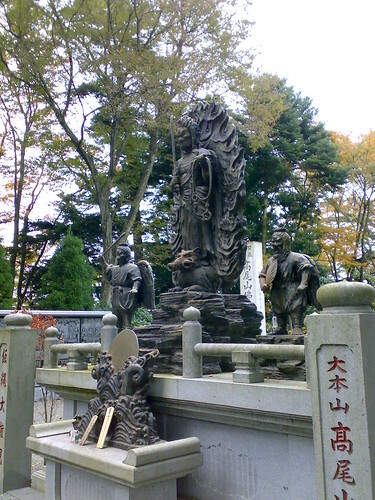 On the both sides of the guardian figure, you find little men with beaks and wings, as well as an 猪 (inoshishi – wild boar). I wish I had spent less time at work and more time learning more about thing like this. Takao-san is a great escape in the brutal heat of summer. 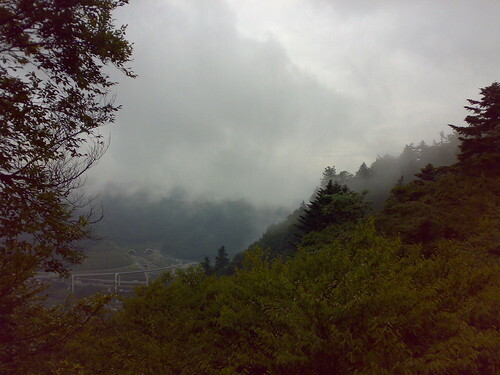 The humidity is gone at the top of the mountain, and on an overcast day it can get a bit chilly. In the bottom left corner, you can see the national highway system diving through the base of the mountains. I don’t know what type of temple this was, but based on the signs it was built by a group of Buddhists that are based in Thailand and popular in and around western Tokyo. 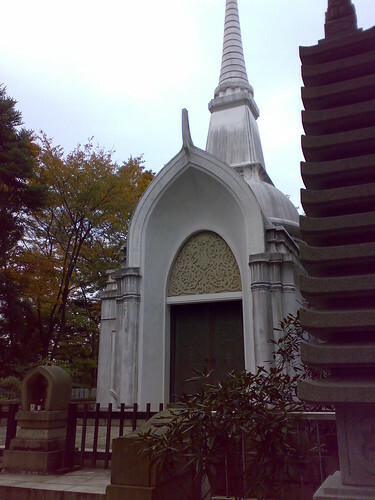 This architecture of this temple is quite different from typical Japanese Buddhist temples. 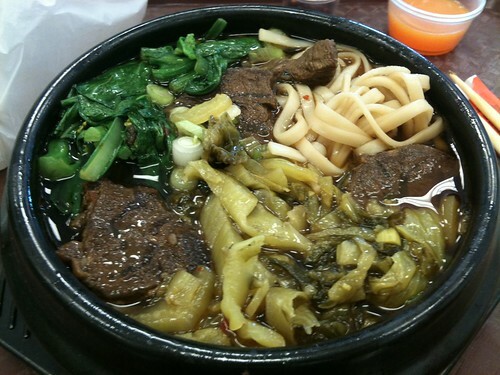 Nothing like a bowl of noodles after walking around all day from the famous ramen chain 万豚記 (Wanzhuji). Each store in the chain is usually a little different from the other, but they have an awesome core menu of Chinese-style food, mixing in elements of Japanese and Korean cuisine as well. 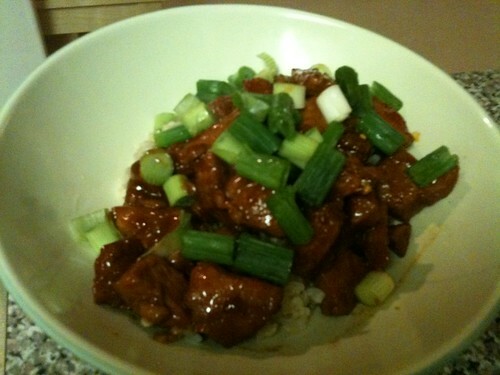 The kim-chee fried rice is to die for, as is their 坦々麺 (Dandan noodles). 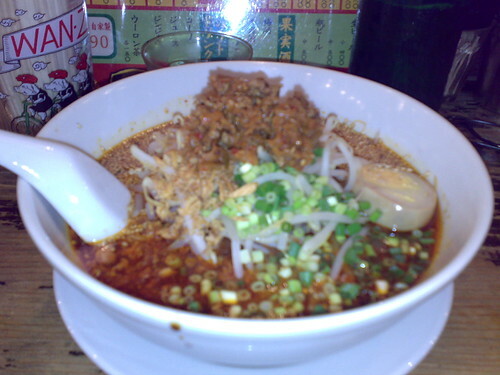 My absolute favorite–that I have only seen offered in two of the chains in Hachioji–is the Taiwan ramen. They put a heaping topping of dried shredded pork on the top that complements the soup so well. I decided to plant a simple garden on the balcony of our apartment this spring so that I could harvest some fresh herbs when I needed them rather than having to buy pre-picked herbs and watching half of them go to waste as I cannot use them fast enough. My first attempt was a partial success. I bought the seeds from a home center, and I planted the herbs in a peat-moss incubator. Due to excessive humidity that lead to a mold problem, my first attempt with cilantro was a complete failure. This was a great shock to me as we had grown cilantro on our balcony of our apartment in Hachioji in the middle of the cold Kanto plains winter and never had any problems. 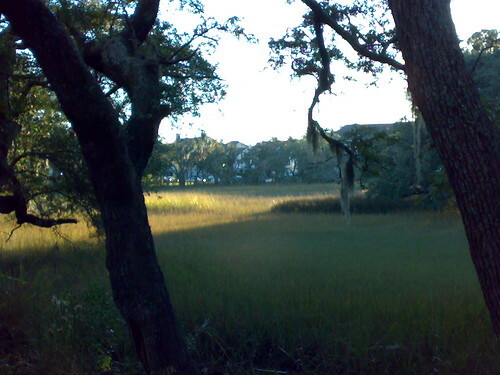 Wouldn’t Charleston in the spring be even better? All was not lost, however. My wife transplanted the Genovese basil I had in the incubator into regular soil, and the basil seemed to grow like magic. After two months, I’ve got a healthy plant growing that is now ready for use in cooking. The basil leaves smell wonderful and I haven’t had to use any sort of chemical pesticides or fertilizers. This plant just goes on water and sunlight. 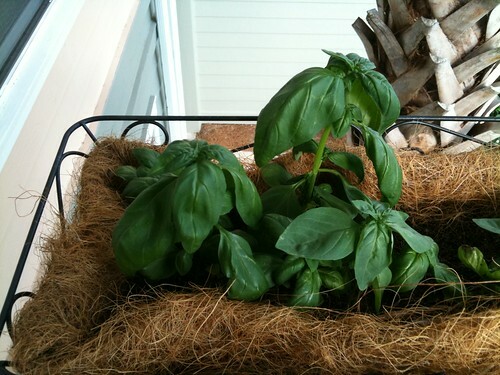 Genovese basil – this plant is a fighter! With my second attempt, I decided to take a much simpler route. I simply rowed the seeds in regular soil, placed them on a spot in the balcony that gets a lot of sun, and made sure to water every few days. 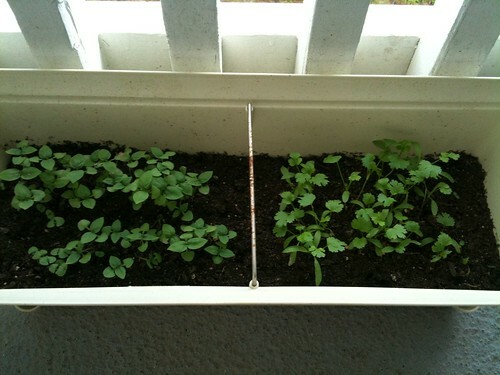 Almost instantly the seeds sprouted and within two weeks I had healthy looking plants shooting up from the soil. Who would have thought that they less I tried, the better things would have turned out. Oh well, I learned my lesson. I’m looking forward to some good Thai cooking in the near future. The South Carolina sun and humidity are good for one thing: growing green plants. November has been extremely wet, with sudden showers and even heavy rains. In the beginning of the month I thought that maybe Charleston even had a monsoon. After bringing it up at work, a coworker reminded me I’m in a sub-tropical climate and that this is the rain season. 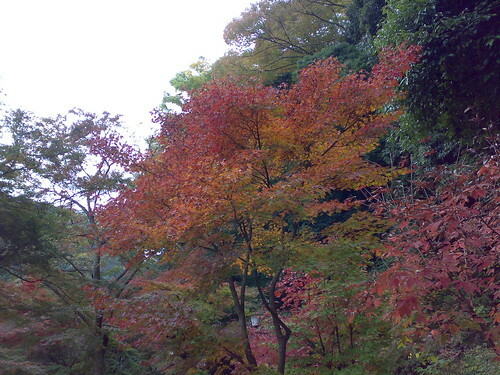 Besides the rain and grey skies though, the leaves are starting to change color and fall to the ground, and the air is comfortably cool at night. Yes, autumn is *finally* upon us. So I woke up around 10 AM on Thursday, feeling somewhat rested after a short yet busy week at work. I knew I had to be back in the office on Friday, so I wanted to make the best of the day and enjoy it however possible. 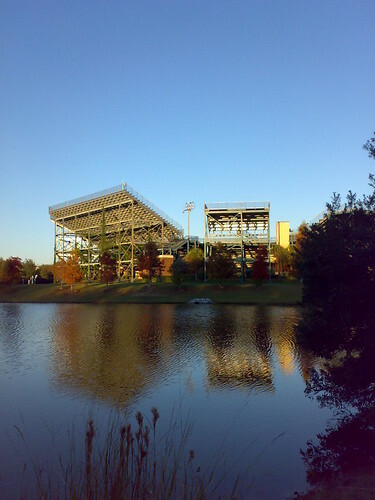 The skies were blue and the morning air was pleasantly brisk and it felt like grand autumn day. What a beautiful day for Thanksgiving! By noon, however, it was up to 20 degrees while I was on the balcony staining my desk and I caught myself stumbling into a fowl mood. I decided that I really just needed to take a walk and get a break from all of chores and what not. So the three of us headed out for a walk around the area. I brought my camera this time! Now that the weather is cool in the mornings, we get a lot of fog. I must make a real effort to get out and walk around the trails in the fog. How eerily beautiful it must be! 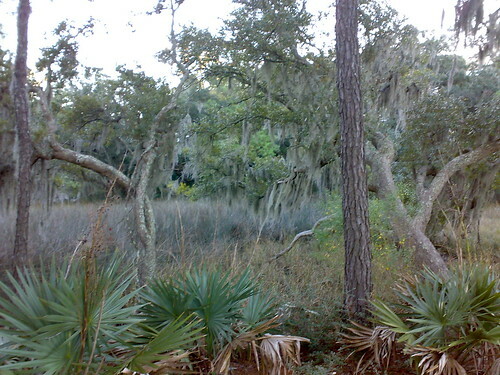 Trees, tropical flora, Spanish moss, and the marsh grass–I really love the Spanish moss on the trees, it adds so much to the environment. 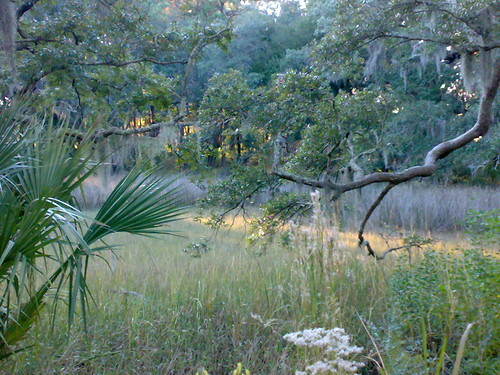 The marsh grasses, saltgrass or sweetgrass, I have no idea which, probably the former. Wouldn’t want to venture out into it though. 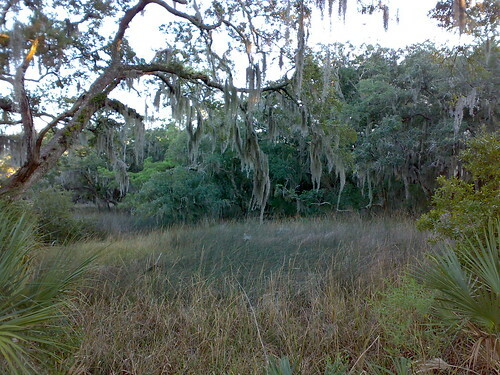 Not only would you sink waist-deep and perhaps get stuck, you might also come across the fiendish cottonmouth or the nearly identical but non-venomous brown water snake. 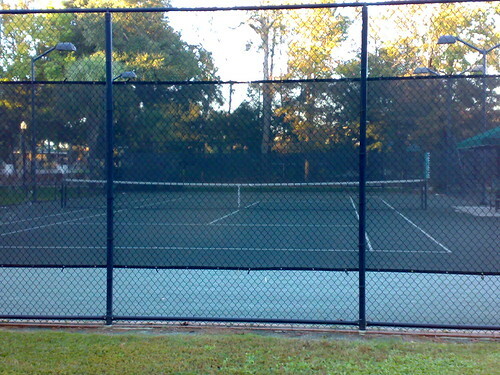 Towards the end of the trail is the tennis club. Lessons start at $60 and hour, and the optional membership is $700 for the individual. There are a few tournaments here during the year, and the pros even come through from time to time on the circuit. I can dream about a membership and private lessons, right? Nobody plays on Thanksgiving. I guess they’re glued to the football games on TV or busy preparing for the big feast…so tempting to just climb the fence! 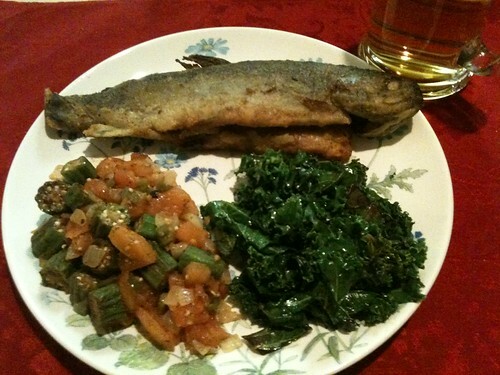 Speaking of the big feast, due to having to work the next day we stayed in town and I tried to cook a small Thanksgiving dinner. A traditional dinner would consist of turkey, stuffing, gravy, mashed potatoes or yams, green beans, and of course pumpkin pie. With just two of us though, I wasn’t going to bother with something like that. I picked up a Long Island-style duckling at the super market, and I also found a nicely-sized butternut squash. It’s close enough to a pumpkin, eh? 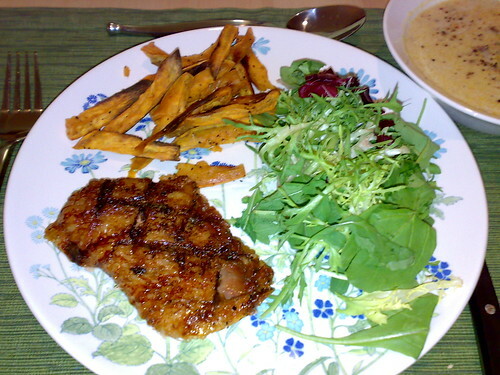 So our menu was roast duck with an orange-peach glaze, butternut squash bisque, sweet potato wedges, and a plain ol’ salad. Not very traditional, but still very “autumn.” If you’ve never tried butternut squash bisque, I highly recommend it. It takes about two hours to prep but its well worth it. The first step is to separate the butternut squash “meat” from the skin. To do this, split the squash in two, clean out the insides, and place the halves face up in an oven pan with about a centimeter of water in the bottom at 175 degrees C for an hour. Add more water if the level starts to get low as the water evaporates. After about an hour, take the squash out of the oven and let it cool for a few minutes. The skin should peel easily from the flesh of the squash with the help of a decent knife. After you got the flesh out, cut it into small pieces so that when we boil them down it doesn’t take too long. While you’re at it, dice the small onion finely and set it aside. In a deep enough pot (4 qt. ), add some olive oil and the diced onions and let the water seep out of the onions in the pot. 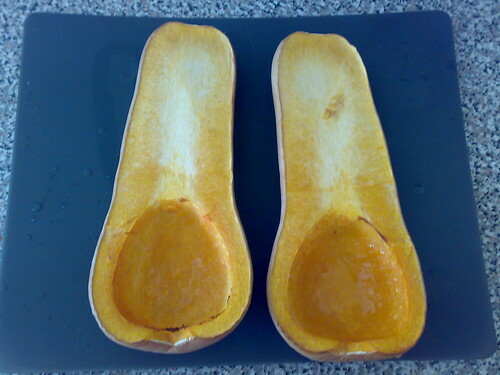 Add your chopped up butternut squash, and add enough soup stock to cover the butternut squash completely. Cover, and let it come to a boil on medium-high. Stir occasionally, smashing up big chunks of the squash if you have the opportunity. As time goes buy the squash will break down and the any lumps will be small enough to become “character” in the soup. You may need to add more stock depending on how thin you like your soup and how well broken down the squash is. Don’t add too much though as we still need to add the cream near the end. When you’ve gotten the soup to a texture that you like, turn the heat to a very low setting and continue stirring. 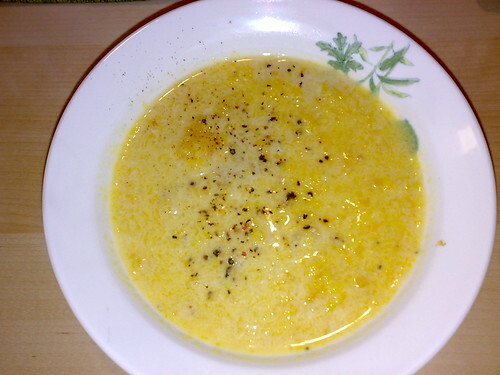 Add any spices, salt, peppercorns or what not now so that it can be absorbed by the soup. I like to leave it at this stage for about an hour, stirring occasionally. When you’re ready to serve, add the cream and stir it into the soup. Stir occasionally for a few minutes, and then serve. A 2 lb. butternut squash should produce enough bisque to feed at least six, and you can always save it and heat it up later. 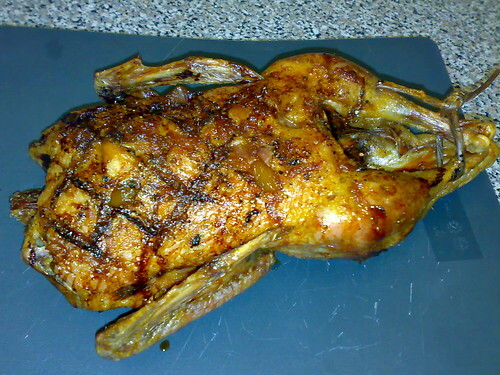 The duck came out well too, though the appearance was not as nice as I’d hoped for. I followed The Hungry Mouse’s recipe, but I made my own glaze with Shoyu, Mirin, and peach jam rather than honey and molasses. Not too shabby for our first Thanksgiving in the USA. The sweet potato wedges were great too. I first tried them back in September on a job interview in Connecticut. The sweetness of the sweet potato combined with a bit of salt and pepper is a great combination. To all of those celebrating Thanksgiving, hope you had a good one!